Take Swedesford Road and turn north onto Wisteria Drive, then right on Hayfield Road to the end. Take North Valley Road north to Tree Line Drive on left. Walk down private drive at circle. The Preserve was assembled over the years from four contiguous parcels. The first was a gift of 9 acres from Mr. & Mrs. Robert Maes in 1975 – known then as the Orr Nature Area, OLC’s third preserve. It was extended to the south in 1987 with the donation of 19.2 acres from Pohlig Builders. Southerly expansion continued with the purchase of 10.5 acres in 1990 and 7 acres in 1997. The land forming the Preserve was farmed for three centuries. 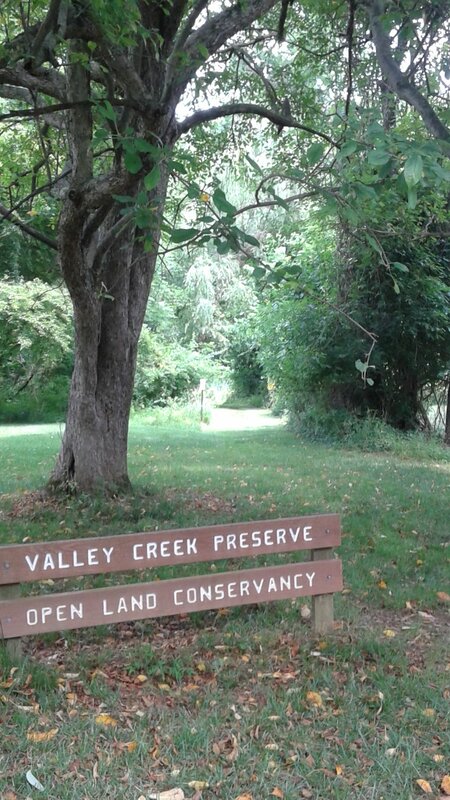 The first European to occupy the area of the Valley Creek Preserve was a Welshman, Thomas Jerman, one of the first settlers in Tredyffrin Township. He purchased 300 acres of land that encompassed the preserve in 1701. He built a grist mill and constructed a dam and mill race on land that is now just south of the southern boundary of the Preserve. A subsequent owner, John Rowland, built a second mill, where the present Great Valley Mill stands. A later owner, Adam Rickabaugh, converted the first mill to a crushing mill and crushed hemp and produced vegetable oil. The mill was still in existence as late as 1878. The land has since passed though many hands, being divided and re-consolidated. A 1937 aerial photograph shows cultivated fields on the higher elevations, pasture down to the creek and very few trees. By the seventies, though, most of the cultivation had ceased and the land began its return to nature. 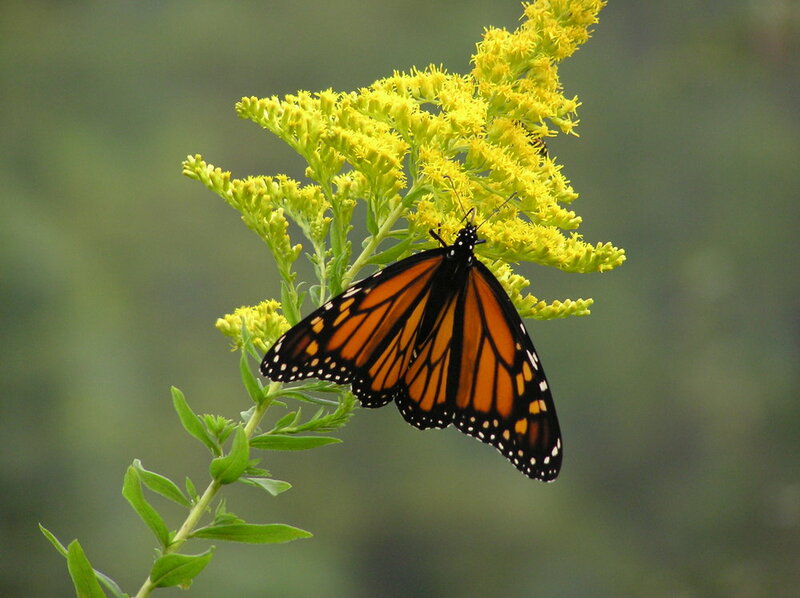 However, that return has been dramatically impacted by three forces common to all OLC’s valley preserves: invasive species, deer and storm water. The woodland canopy and understory lack diversity, with typical forest trees such as oaks, hickories, beech, black gum - and most notably the usually abundant red maple - rarely found. Invasive shrubs and vines have thrived. Phragmites (Common Reed) advancing along the flood plain is a particular current threat. Thanks to generous donations of time and money from neighbors and hundreds of hours of volunteer effort we are making progress against these threats. In 2007-8 a five acre old field over run with multi-flora and vines was cleared and planted with warm season grasses. 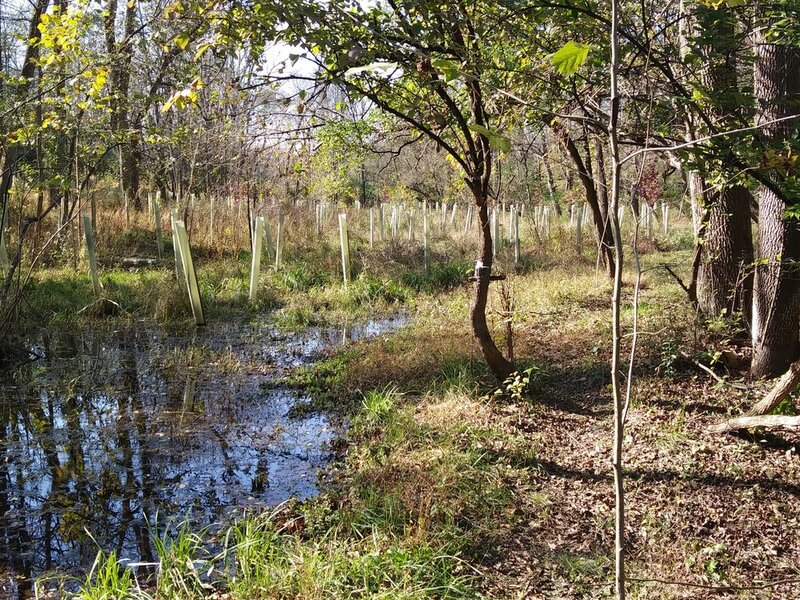 In October 2014, OLC continued its partnership with Green Valleys Watershed Association and Siemens Medical by planting a half acre of riparian buffer with 350 native wetland-loving trees to replace Phragmites and honeysuckle. 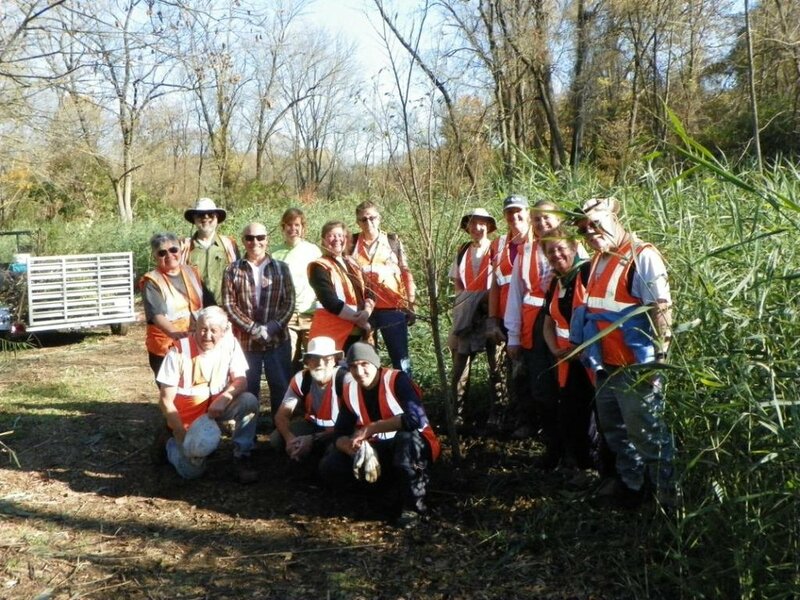 We are planning to use this project as a model to obtain funding for a comprehensive project to eradicate Phragmites from both Valley Creek and Cedar Hollow Preserves. We are also working to enhance access. An Eagle Scout used timbers from an old bridge to create ditch crossings and open up a wetland trail connecting Overlook Place and Page Place with the north east of the preserve. Neighbors donate time and equipment to keep the trail network mowed. All this effort is geared towards the perpetual protection and enjoyment of this narrow artery through Western Tredyffrin for the benefit of all its wildlife residents, from the trout and great blue heron (and the fishermen/women) that try to catch them, through the red fox, ducks, turtles, kingfishers, blue birds and more that you may be lucky to see.